On January 7, 2014 we headed down to start this new adventure in our lives. This blog will attempt to capture our experiences, sights, thoughts and hopes as we move ourselves down to Costa Rica and start living there. 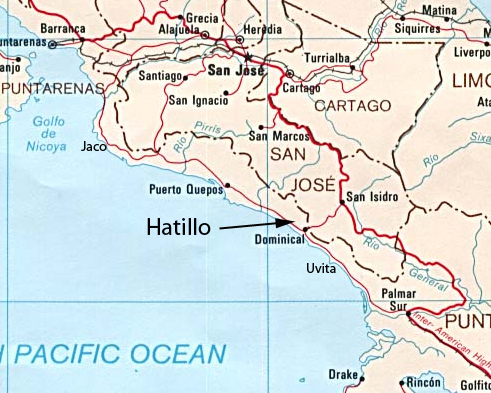 We live on the Southern Pacific coast of Costa Rica in Hatillo near Dominical. We chose to settle in this part of Costa Rica for many reasons – primarily the abundant wildlife, proximity to the ocean, climate and remoteness of the area. Wow this is way too cool, I’m glad I stumbled on your blog, because I am looking to do the same in the not-too-distant future. I’m 25 and I’ve traveled to Costa Rica twice and its such an adventure! So cool to see someone making the ‘leap’. Dominical is beautiful too. Probably my favorite city on the Pacific, in total I’ve spent about a week there. 5 days on one trip, and then a 2 nighter cutting back to San Jose from Corcovado on another. I hope it’s not too much to ask, but I’d like to learn about the logistics and your experiences in buying/renting land there. Might you like to exchange a few emails for a curious and motivated traveler? I’d love to hear from you, but looking forward to following your adventure regardless! Hi ya’ll! I’ve been keeping up with your house building and your blog altogether. Very interesting. My wife and I would love to do something like this at some point too. We’ve visited Bocas Del Toro and Roatan .. both beautiful but our next destination will be Costa Rica. Been doing a ton of research before hand. We are still 5+ years away from being able to relocate, so it’s nice to watch from a distance someone’s journey. Keep up the great work. So excited for both of you and what your future in CR holds for you! God Bless. We are ready to build in Santa Teresa/Mal Pais using Panacor. We woul love any suggestions on how to find a builder familiar with Panacor. We have contacted Panacor but have not heard back as of yet. We are only here for another 4 weeks, but our son stays. Love your Blog. Just found it tonite in my search for PEX. You have done a great job on your new home and your educational blog. I visited your home a few weeks ago with our contractor which he have in common (Marvin). Hope we see you again some day. We are from California and building in Uvita, just around corner from you guys. We too took the leap, sold everything and are renting while we build. Have done lots of research on the PEX, you are right it is the best way to go. But, of course I can believe it, you two can accomplish anything! So happy for you! Your home is beautiful! Congratulations on making it a reality. It’s been awhile! I’m glad you found our blog and thanks so much for reaching out. It is great to have finished the house and to start enjoying it. You know you’re always welcome to come down and stay with us. Costa Rica is always an adventure! I love the pets and the videos of the monkeys and was that a sloth? ( it looks like me on most mornings )Amazing. You will have to send an email address so that I can send you photos and show off my children. I will look forward to reading your updates. Congratulations! Your home is amazing. My wife and I are doing the same thing in San Vito. We found you researching Panacor, just like someone else who commented previously. Our intention is to you the System 1 panals which have a Mg finish already on the outsides of the panels. Are you happy with you decision to use Panacor? Do you feel as though it was an economical choice? Thanks for your comments. We are certainly enjoying the fruits of our labors. I have heard about the panels with the Mg finish, but don’t have anything to base a direct comparison to the Panacor. We went with the Panacor system vs. some other due to our builder’s experience with the product. Panacor did certainly save money on labor and reduced the time to completion. I would do it the same way again. Good luck with your project! We love how your home turned out – seems like overall most things went pretty well for the build. Does Marvin and his crew speak English? We are trying to build something in Platanillo from 4,000 miles away and it makes us fear the ‘lost in translation’ piece (we speak almost no Spanish but are currently working to offset that! ), as well as not being on site daily/weekly. Does he have a website? Was there a builder that would have been your second choice? Thanks for sharing your ongoing fun story. Thanks! We love our new home! It came out better than I expected, so can’t beat that. Marvin and his crew do not speak English. His brother, Minor, who is an electrician and does the work on Marvin’s jobs, does speak English, but is not on site daily. There can be plenty of miscommunication if you don’t have someone to translate. I would not want to have tried to build this house from long distance. You need someone who is there to oversee and answer questions as they come up. If not, you are not likely to get what you want or envision. I would like to introduce myself, my name is Randy Havener and wife is Michele. I found your blog while researching Panacor building materials in Costa Rica. I haven’t read all of your blog yet but what I have read and seen so far is very impressive. Michele and I are just getting started on our journey to Costa Rica for retirement. We have purchase our property last year and planning to start building next year. Our property is not to far from yours. The location is the south end of Uvita up on a hill over looking the ocean similar to your beautiful home. From what I have read so far on your blog our plans are very similar to what you and Ellen have already done. The information that you supplied in your blog has been very helpful. If you don’t mind I have few questions on the Panacor building materials for a home. Please let know if you have time to answer them. I will continue to read your blog and I’m sure it has lot more helpful information. Thanks for your comments and glad you’re enjoying our blog. We have had a wonderful journey so far and hope that you do as well. I am happy to try and answer your questions. Wondering how you like the plastic roof tiles. I am planning construction on my lot in the neighboring country to the north and thinking about using tejareal. Just looking for some honest feedback. So great to be able to see your blog…..what an amazing home! The kids and I love seeing the pictures and videos of the turtles and your pets. Glad that you are enjoying your life there…..I can’t believe that you turned 60 Ed. It’s a good thing that they have you to brew 😀. So scary Nate must have been and that Boulder is amazing…..the kids want to the footage of the alligator eating that man….NOT going to happen…gross! Let us hear from you when you have time. Hello from Chapel Hill, well, actually Carrboro! Diana and I are moving to Costa Rica (Moravia, suburb of San Jose) and we had a couple of questions regarding a shipping container and the customs costs that you encountered on your move. We’re planning on moving at the beginning of 2019, and we’ve been trying to get our heads around the costs, as the estimates vary significantly. Any help at all and we’d be eternally grateful!